ALMANAC - the new band of Victor Smolski (ex-RAGE) - stands for a new dimension of symphonic power metal, featuring three singers Jeannette Marchewka (LINGUA MORTIS ORCHESTRA), Andy B. Franck (BRAINSTORM) and David Readman (PINK CREAM 69). 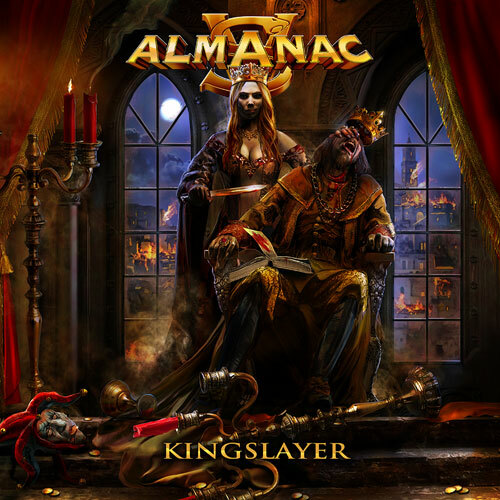 In March 2016, ALMANAC unleashed their highly acclaimed debut album »Tsar«, which entered the official charts in both, Germany (#74) and Switzerland (#87), followed by a European tour along with ORDEN OGAN, as well as their own headliner tour in spring 2017. ALMANAC recorded their second longplayer entitled »Kingslayer« at HeyDay Studios in Wuppertal, Germany. "Our second strike is done," reveals guitar player Victor Smolski and explains, that "»Kingslayer« is the logical follow-up to »Tsar«, just more compact, heavier and faster. Our previous live experiences could be perfectly permitted during the recordings. The band got closer and well attuned, you can feel this unified energy within the new tracks. We took a lot of time and gave our very best. »Kingslayer« is a crafted metal album with a lively power sound!". »Kingslayer« has been released on November 24th via Nuclear Blast, reaching position 71 at the Viva charts, even there was hard christmas competition. The cover artwork was once again created by Hungarian artist Gyula Havancsák (ACCEPT, DESTRUCTION a.o.). In July, ALMANAC played at the 'Masters of Rock' festival, where they presented the first two new tracks live, 'Losing My Mind' and 'Children Of The Sacred Path'. The concert is part of the bonus live DVD, which has come along with the limited first edition of »Kingslayer«. ALMANAC has played a headliner tour in Russia just for release of »Kingslayer« and they are planning a Europe tour in 2018.